UL 1786 Paragraph 11.6 covers requirements for surge testing of luminescent panels used in a night light. Figure 13 outlines a Voltage transient test to be applied to a specific test pattern allows testing to determine spacings. The Surge Generator circuit is specified in UL 1786, Figure 13 is contained in the MegaPulse 746E. 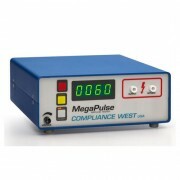 One press of the MegaPulse 1786P TRIGGER button conducts the test suite as described in UL 1786 Paragraph 11.6. Note: Voltages 400V and over are certified to be in accordance with the tolerances ofIEC 1180-1, Para. 6.2.2. Provided with external interlock control. In addition, for automated testing, the MegaPulse 1786P is available with TestMinder, our computer control and test reporting option, and Arc Detect, which can detect and report an insulation failure. When both of these options are ordered together, the computer-generated test report will advise which tests passed and which failed.